SarahViz.com: Giveaway for Two Tickets to Six Flags New England! Giveaway for Two Tickets to Six Flags New England! Not the ride. Just the sign. Recently I was invited to Six Flags New England to preview their brand new ride, the SkyScreamer. The name sounds totally harmless, right? NOT. Being a wimp when it comes to heights (see: fear thereof), I decided I better bring in some backup to accompany me on this mission. All four of these yahoos were eager to give it a scream, errrr, whirl. You guys, it's the tallest swing ride in the world at 40 stories high and 400 FEET up in the air. 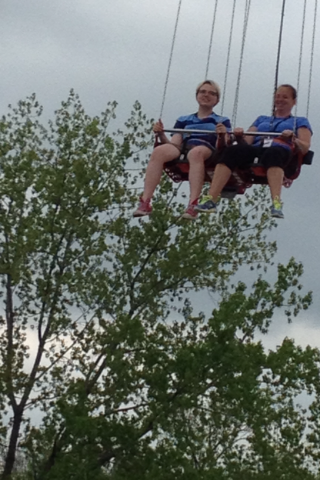 And if that's not enough for you, the swings go around at 40 MILES PER HOUR. This picture doesn't even come CLOSE to doing it justice. Just trust me when I say it was rully rully rully high. I didn't go on it our first time around. Nothankyou. But then, after riding few of the other rides that were open for us at the park that day (Cyclone, Flashback, and Pandemonium) and a yummy bbq lunch put on by the park, I got stupid brave all of a sudden and decided I'd be a Big Girl and ride the Very High Ride, which was, after all, the main reason why we were there. I mean, what kind of blogger would I be if I didn't?! My Niece was kind enough to offer to ride with me. Let me just say that while the ride boasts of a "beautiful panoramic view of the entire park and surrounding areas, including the Connecticut River and New England horizon"...I wouldn't know. From the time we started revolving and then lifting, my eyes (involuntarily) stayed glued shut. My breathing got shallower. My fists clenched the bars (and at one point, my Niece's shorts). What seemed like 30 minutes was probably only 3. It was COLD up at the top, that's all I know. If you're a daredevil thrillseeker, this ride is for you. Or, you know, a 9 year old boy. Whatev. Six Flags New England has been kind enough to allow me to give away a pair of Print-n-Go tickets valued at $119.98! Please follow the rafflecopter below! For more (of my) information on navigating Six Flags, click here. Saw this on a commercial today! That ride looks insane! We won Six Flags tickets from you before so I hate entering, but my boys would love it if we won again! Sadly I'm afraid of heights so don't get on many rides - but rides with water are always fun!